David Williams, a researcher in the Santa Cruz Institute for Particle Physics (SCIPP) at UC Santa Cruz, chairs the CTA-US Consortium. The SCT optical design was first conceptualized by U.S. members of CTA in 2006, and the construction of the pSCT was funded in 2012. The member institutions of the CTA-US Consortium include the UC Santa Cruz Department of Physics and the Santa Cruz Institute for Particle Physics. Preparation of the pSCT site at the base of Mt. Hopkins in Amado, AZ, began in late 2014, and the steel structure was assembled on site in 2016. The installation of pSCT’s 9.7-meter primary mirror surface, consisting of 48 aspheric mirror panels, occurred in early 2018, and was followed by the camera installation in June 2018 and the 5.4-meter secondary mirror surface installation, consisting of 24 aspheric mirror panels, in August 2018. 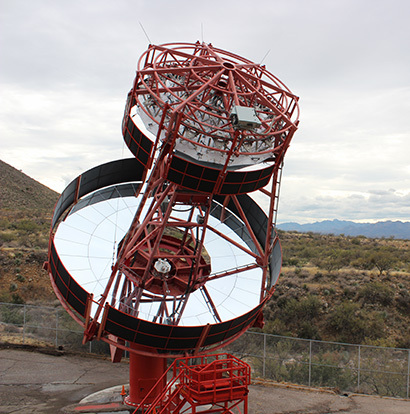 More information about the pSCT is available online at www.cta-observatory.org/project/technology/sct.